That’s the Niva-3 part of Kandalaksha. Lots of “nostalgie” type things, judging from past freemarkets. Dates: Nov. 23 to Dec. 7. 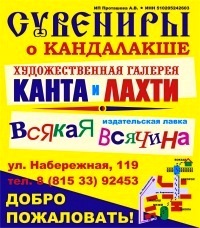 Location: Hotel Belomorye, ulitsa Pervomayskaya 31. This unassuming place at ulitsa Belomorskaya 33 by the port has the town’s freshest selection of fruits and vegetables although the choice is basic. Closed about 8pm in the summer and earlier in the winter.